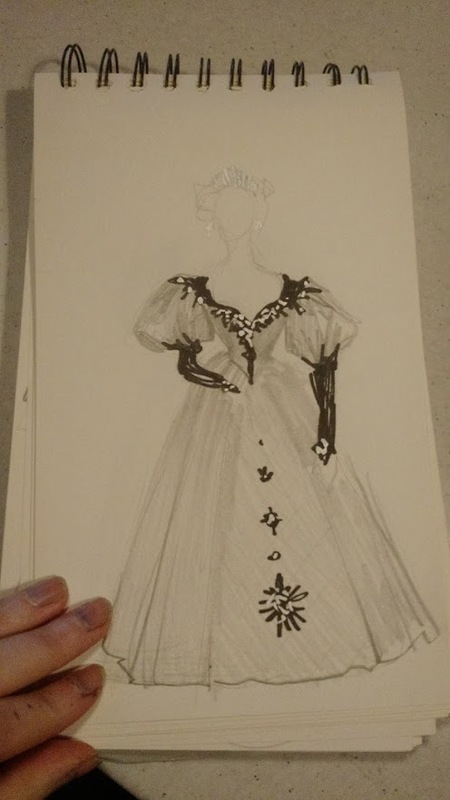 I wanted an “Evil queen dress” for some time. I wanted a statement gown, something that could define sort of Grimilde Malatesta’s style. Ok, this is not it. 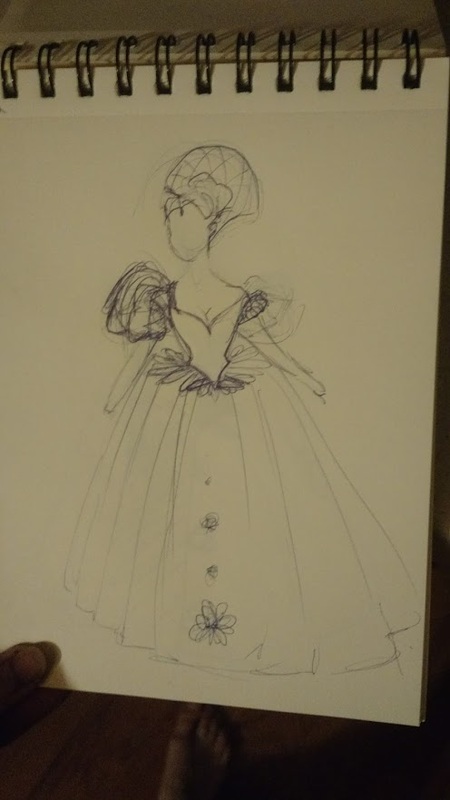 It is a very beautiful looking gown, but still a bit too much princess-like. However it is big, it is red, and it really stands out. I knew I wanted a boned bodice like the one in the wine velvet dress, and a wide skirt to make the waist look even thinner. And big and long sleeves. It changed a lot during the process. At first I wanted it to be made in shotgun gray shantung, with silver sequins and black rhinestones. Or black sequins and white rhinestones. However, I did not find the color I wanted, and there was not a color of shantung that I liked for this dress. So I walked around the shop for quite some time, and then I saw this. It was not what I wanted, but it was a deep red, a saille with red and black threads, that was shiny and soft. And very very cheap. So I got this synthetic blend beauty, ten meters of it for thirty euros. Having it in synthetic was quite a relief…silk is quite fragile, and hems tend not to last long, especially when you have a train, even a small one. No matter how many linings and interlinings, the edge gets nasty when the fabric is fragile as silk. This should like longer. I started making the bodice. I made it as the wine velvet one, two layers of thick cotton, boning as a pair of stays, covered in red fabric and handmade eyelets at the back for spiral lacing. I corded the edges, instead of finishing them just with the bias tape for extra detail. The sequins arrived…in silver. of course! I had ordered them when i trusted I could find some fabric in shotgun gray! It was a fabric from aliexpress, I have to admit this whole dress was made with cheap supplies, but a lot of work made it look like materials were different. I had no time to order a new fabric, so I tried to dye it with iDye Poly, and it worked. Not only it worked, but I ended up with brighter shine on the black, and once I used some sandpaper on the sequins it got even better. At first I wanted to cut out a piece of this fabric, sew it on and done. But this gown was already a sort of cliché, and I wanted something more than the standard appliqué effect. So I came out with the idea of cutting each piece of fabric with sequins, and assembling them on the bodice to create a brocade-like pattern. 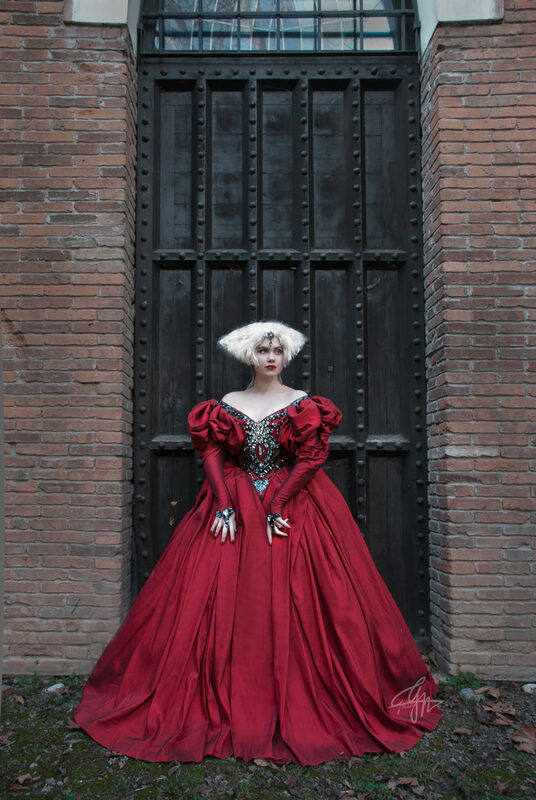 A bit inspired by the red gown from Tale of Tales. After a lot of handstitching, it was done. 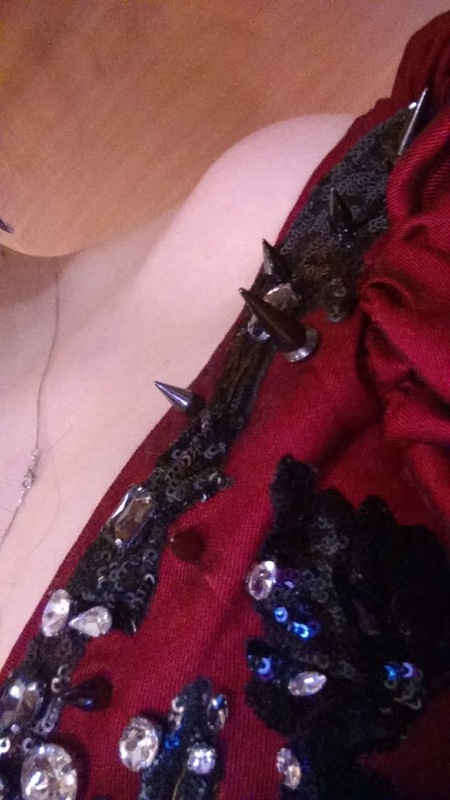 I added fumé and white rhinestones from the center, to achieve the effect of a shattered mirror, and as the sleeves and the skirt looked like huge roses, I added also some spiked studs in dark metal, on the shoulder straps. The skirt was decided. At first I wanted to make the sleeves like that, but without the crispness of the shantung it would have required much more work. 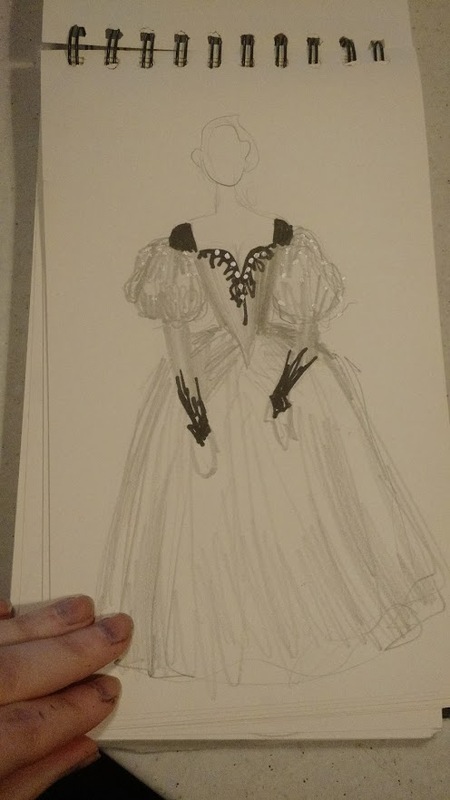 So I ended up arranging a sleeve from a pattern I made for the white gauze dress I made for the teagown. I call it the “pumpkin sleeve”. The sleeve is drawn huuuuge. Then you draw a number of vertical lines, you press them folded, and then gather each one. Once you gather the head of the sleeve to fit in the armhole, the game is done. It’s not hard, you just need a lot of fabric. Let’s say that I could have made a pencil dress out of the fabric I used for a single sleeve. 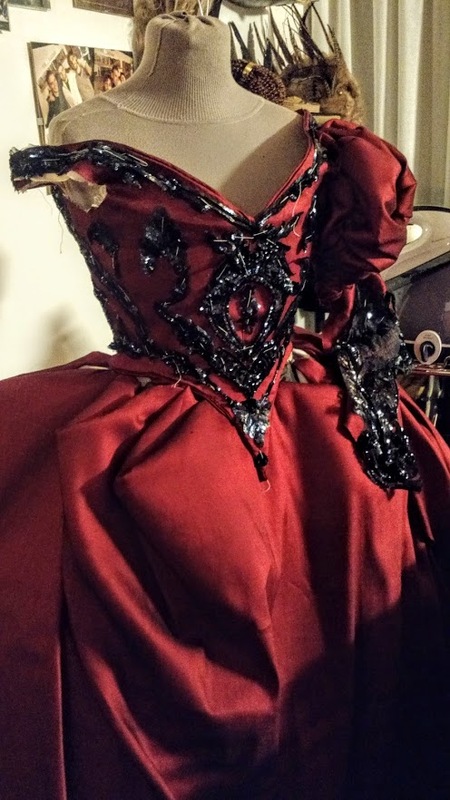 I have used a stiff fabric to keep the folds of the upper skirt, and then sewn them to the bottom of the bodice, adding some lining of the same fabric to cover all the holes. The central back folds are twice wider, and are folded back to have a sort of “bow” effect, and they look a bit like a fabric origami. The dress is worn over a bum roll, my very special crinoline, and a quilted petticoat. I made my back-combed bob wig with what was left of the wig I used for Elsa, quite some tima ago, and used hot glue gun to make the collar-comb. I will wear it ith a Moretta mask. Please see my other blog post to see how to make yours!